All the charm of a board game is at home on-screen. hen board games make the digital transition, things get a bit rough around the edges. A D-pad and buttons can't replace the tactile feel of pulling cards from a pile, and there will always be something fishy about simulated dice rolls. Greed Corp has all the charm of a board game, yet feels right at home on a screen. The first aspect of Greed Corp that makes an impact is the visuals. Adorable mechs at war with one another for control over towering pillars of land will please, and watching over-resourced pillars crumble into the misty depths will thrill. When mechs and buildings go along for the fall, they drop the whole way down until they're out of sight, never breaking the illusion. From the game's expertly done intro to the animating in-game models, Greed Corp will have you lusting. Mechs and buildings fall with over-resourced pillars into the misty depths until they're out of sight, never breaking the illusion.After playing through Greed Corp's heavily detailed tutorial two to three times, one may glean the hidden simplicity behind a digital board game that uses every button on the controller. But confidence gained will drain along with the sixty seconds given for every turn. Sweat beads form as you scan the map accounting for every stray troop and potential opportunity. This adds tension, but mistakes are inevitable and costly. Almost every move is in preparation for the next turn, and a missed opportunity will haunt you while the enemy makes its move. To help soothe frantic planners, the cracking soundtrack is inspired by lounges from the days of prohibition. This pleasantly clashes with the game's aesthetic, but the same cannot be said about the dry story text delivered in between battles. Less would have been more in that category, as the four robot factions tell their stories with their drastic differences in technology. While online seems to lack a consistent community (at least on the Xbox 360), the AI packs a strategic punch, and having one to three other players locally can lead to a good, greedy time. Though, it would be generous to guide your friends through the tutorial nice and slow. 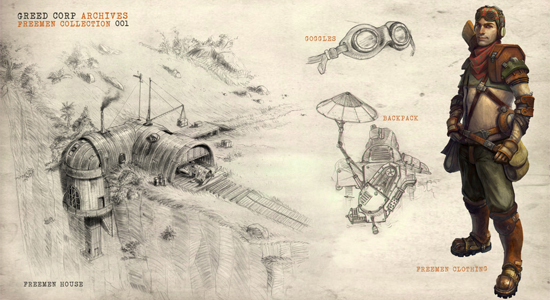 This looks like a lot of fun — Settlers of Catan meets Ring of Red, with a dollop of Steampunk. I absolutely need to download this. It was just a few weeks ago that I learned about the game in Edge Magazine. Apparently, this is just the first in a series of games W!GAMES aims to produce, spanning a variety of genres and art styles — the game world that sailed a thousand ships, if you will.